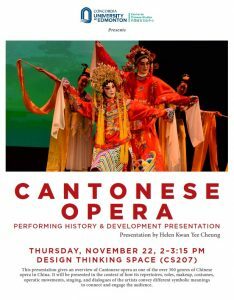 The Centre for Chinese Studies and the Department of Fine Arts proudly invite you to Cantonese Opera Performing History & Development Presentation. This presentation will give an overview of Cantonese opera as one of the over 300 genres of Chinese opera in China. It will be presented in the context of how its repertoires, roles, makeup, costumes, operatic movements, singing, and dialogues of the artists convey different symbolic meanings to connect and engage the audience. The Presenter –Ms. Helen Kwang Yee Cheung– has a diverse professional background in business, social work, personnel, and inter-governmental relations. She has served as a community volunteer in Edmonton for close to three decades in various leadership positions on many community and business Boards. She received the Queen Elizabeth II Golden Jubilee Medal, the Governor General’s Caring Canadian Award and the University of Alberta Alumni Centenary Award for her contributions to Canada and to the University of Alberta. Helen has a Bachelor of Social Sciences degree from the Hong Kong University. She pursued lifelong learning after retirement and received her Master of Arts Degree in East Asian Interdisciplinary Studies at the University of Alberta in 2013 with outstanding academic achievement. All are cordially invited to join us at the presentation at 2 pm on Thursday.